This event will take place on December 9, 2013 in Seattle, Washington and will be hosted by WWE Hall of Famers Booker T and Jerry Lawler. AJ goes off on "Total Divas"
APP EXCLUSIVES: Slammy Awards pre-show, airing exclusively on the WWE App at 7:30/6:30 CT before Raw! Cody Rhodes "I don't have Instagram. I'm an adult." CM Punk "I did it for Andy Kaufman." The Great khali "Yes, this is the real Great Khali. I'm ready to tweet with you!" CM Punk calls Daniel Bryan "goat-faced"
Sheamus to Dolph Ziggler, while Ziggler was standing on a ladder: "Look at you there, Ziggler. You're finally taller than everybody, congratulations." The Rock to John Cena: "If John Cena had led the American Revolution, right now all of us would be playing cricket, we'd be sipping tea, and we'd be blessing the Queen." Daniel Bryan tells why he's "Mr. Small Package"
Santino Marella beats Jack Swagger for U.S. Title. Rey Mysterio pinned Damien Sandow (3:10). Kaitlyn pinned Eve Torres (2:06). Kofi Kingston pinned Lord Tensai (1:07). The Great Khali pinned David Otunga (1:53). Brodus Clay pinned JTG (1:51). Cody Rhodes pinned Sin Cara (4:15). Alberto Del Rio, The Miz, & Tommy Dreamer beat Heath Slater, Drew McIntyre, & Jinder Mahal (14:12) when Dreamer pinned Slater. Ryback beat Antonio Cesaro (2:32) via countout. John Cena & Vickie Guerrero beat Dolph Ziggler & AJ (4:26) via DQ. Note: Awards 1 thru 11 were announce on wwe.com. The Big Show beat Wade Barrett (1:35) via DQ. Dolph Ziggler beat Cody Rhodes, Daniel Bryan, and Zack Ryder (15:20) when Ziggler pinned Bryan.in a "fatal four way" match. The Miz & Alberto Del Rio beat CM Punk & Randy Orton (12:38) when Miz pinned Punk. John Cena NC Mark Henry (8:35). Note: Awards 1 thru 10 were announced on wwe.com. The Big Show beat Wade Barrett (3:42) via countout. Kofi Kingston & Daniel Bryan beat Dolph Ziggler & Ted DiBiase, Jr. (3:06) when Kingston pinned Ziggler. Cody Rhodes pinned Mark Henry (2:46). The Miz pinned Rey Mysterio (7:00). Sheamus DDQ John Morrison (0:34). Michelle McCool won a "battle royal" (3:28) to win the Diva of the Year Slammy. Also in the match were: Brie Bella, Nikki Bella, Alicia Fox, Kaitlyn, Kelly Kelly, Gail Kim, Layla, Maryse, Melina, Rosa Mendes, Natalya, Beth Phoenix, Tamina, and Eve Torres. Edge pinned Jack Swagger (4:44). Randy Orton beat Alex Riley & David Arquette (3:19) in a "handicap" match when he pinned Riley. John Cena pinned David Otunga (1:43) via submission. American Bank Center drawing ??? Christian, The Great Khali, & Kane beat William Regal, Vladimir Kozlov, & Ezekiel Jackson (2:28) when Khali pinned Kozlov. Kofi Kingston beat Cody Rhodes (0:58) via DQ. John Cena beat CM Punk (1:37) via submission. Randy Orton beat The Undertaker (3:16) via DQ. Chris Jericho & the Big Show beat WWE Unified Tag Champs Shawn Michaels & Triple H (0:35) via DQ. Yoshi Tatsu, Mark Henry, & John Morrison beat The Miz, Zack Ryder, & Drew McIntrye (2:09) when Tatsu pinned Ryder. Mickie James, Melina, Kelly Kelly, Maria, Gail Kim, Nikki & Brea Bella beat Rose Mendes, Layla El, Michelle McCool, Natalya, Beth Phoenix, Maryse, & Alicia Fox (1:16) when James pinned Mendes. John Cena pinned Randy Orton (8:57) to win the Superstar of the Year Slammy. Howard Finkle's "Out-think the Funk"
Cody Rhodes & Ted DiBiase Jr.
CM Punk pinned John Morrison (8:18). Charlie Haas pinned VP (3:12). Chris Jericho pinned Jeff Hardy (5:47). Fit Finlay & Hornswoggle beat Santino Marella & Beth Phoenix (1:16) when Hornswoggle pinned Marella. Rey Mysterio pinned Kofi Kingston (3:12). Randy Orton, Manu, & Cody Rhodes beat Triple H & Batista (10:15) in a "handicap" match when Orton pinned Batista. Dolph Ziggler beat R-Truth (3:57) via countout. John Cena NC Edge (7:44). Lifetime Achievement Award presented by Vince McMahon to Fred Blassie. 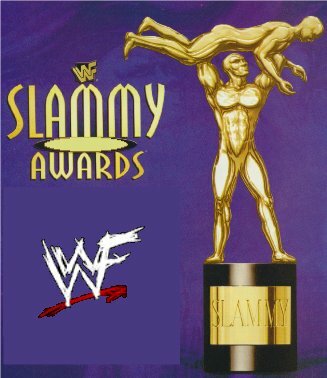 Dormant for years, awards referred to as "Slammy Awards" were issued by Todd Pettengill and Stephanie Wyand in early 1995 on WWF Mania. Islanders Haku & Tama, Andre the Giant, Hercules, King Kong Bundy, & Harley Race. Gene Okerlund performed "Tutti Frutti." Jimmy Hart performed "Eat Your Heart Out Rick Springfield." Hillbilly Jim lip-synched "Don't Go Messin' with a Country Boy." Junkyard Dog lip-synched "Grab Them Cakes."